This card is a little different for me. I usually make cards with Cricut cuts and don't do a lot of stamping. I tried working with some stamped images a long time ago and I colored them using colored pencils and gamsol but I didn't enjoy the process very much. Then I watched the Copic craze in the stamping world - I bought a few markers and tried them but I didn't want to get caught up in an another expensive collection! 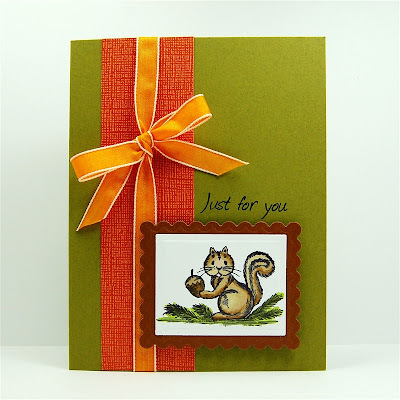 I was still intrigued by the lovely cards with colored images that I saw on many blogs and websites. In a lovely twist of fate (for me and maybe for you!) 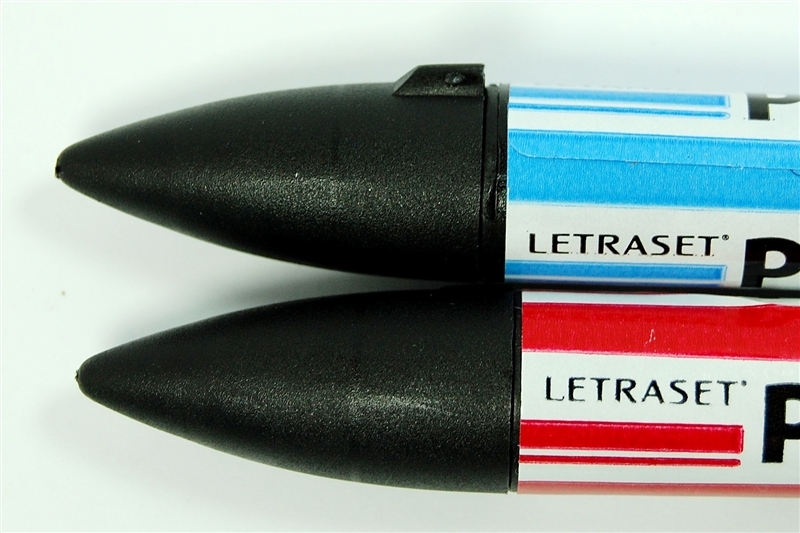 I was contacted by Letraset, a UK company that manufactures art and design products. Two of their most popular products are marker pens known as Tria and ProMarker. Both of these pen lines contain high quality alcohol dye based inks which are fully blendable and produce clear and vibrant color. The Tria marker is the high end and more expensive marker which is available in 300 colors. 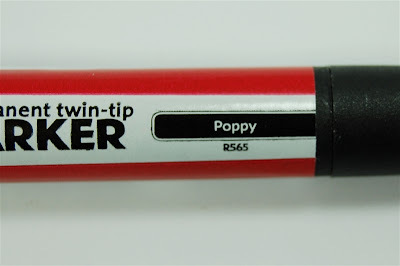 These markers have a unique design with three nibs combined in one marker and they are fully refillable. ProMarker is a less expensive but still very high quality pen with two nibs, a chisel tip and a bullet tip and is available in 148 colors. ProMarkers are not refillable but they can be replaced inexpensively. Both types of markers use the same HSL (Hue, Saturation and Lightness) color system which means they can be used together and the color relationship will be the same. Letraset sent me a starter set so I could try out the ProMarkers and share my impressions with my blog readers. They arrived last week and I have just now had a chance to start experimenting with them. I thought I'd start out by doing a bit of comparison to the Copic markers. As you can see above, the markers are nearly identical in size. The Copic marker has a flattened shape and the ProMarker is round. I found the ProMarker slightly more comfortable to hold but that is probably a matter of personal preference. The caps on both snap on tightly to keep the ink from drying out. 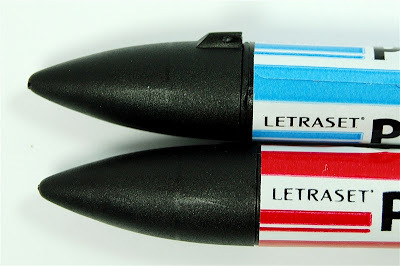 The caps on the ProMarkers make it very obvious which end has the fine tip nib - one end is pointed and the other is flat. The Copic marker has identical ends and you have to look for the darker gray line or tiny printed image to see which end has which nib. The flattened shape of the Copics is meant to keep them from rolling on the desk. I noticed that there is a slight bump or tab on the cap of the ProMarker that helps to keep it from rolling. The color name and number are printed on the label of each marker. This can be hard to see but the label color matches the ink so you can grab the right color at a glance. My blogging friend Enfys (more about her in a minute...) has added adhesive circles colored with each marker to the chisel end cap so she can see the colors if the markers are piled in a container. I did some experimenting with the fine point bullet nib of the ProMarkers and the brush tip of the Copics. I found it easier to get a thinner line or smaller dots with the ProMarkers. 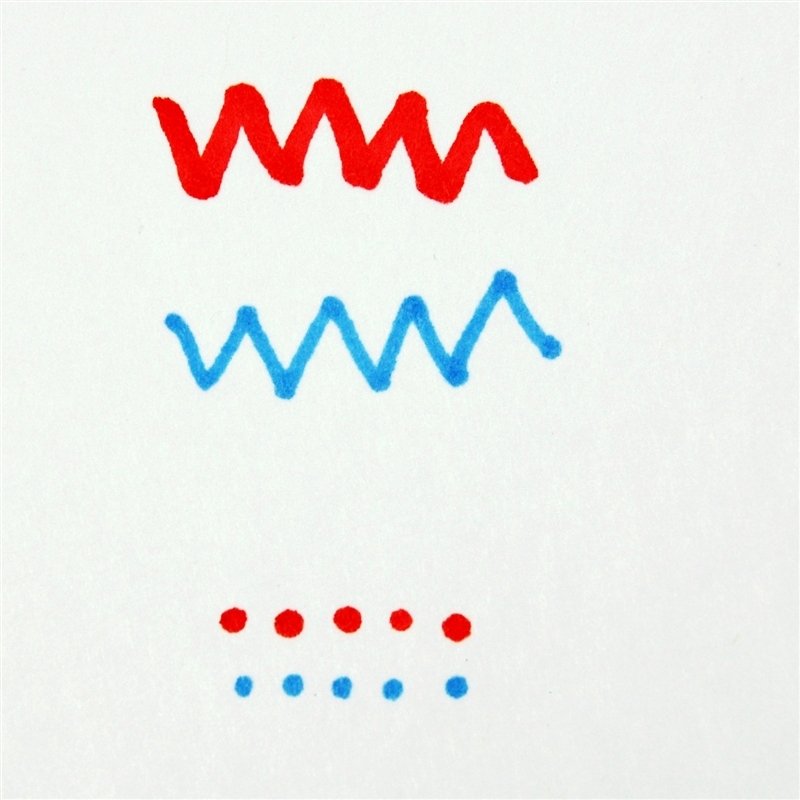 In the image above the blue items were done with the ProMarkers and the red lines and dots were made using the brush tip on a Copic. I mentioned that I first learned about these markers from Enfys, while looking at her great cards on her blog, Going Buggy. Well ... here is the exciting bit - Enfys actually has a full set of 148 ProMarkers to give away this week. She is also doing a series of videos and information about how to use the markers this week. You'll definitely want to visit her blog to try to be the winner and to learn more about these markers. Here is a LINK to the post about the giveaway. 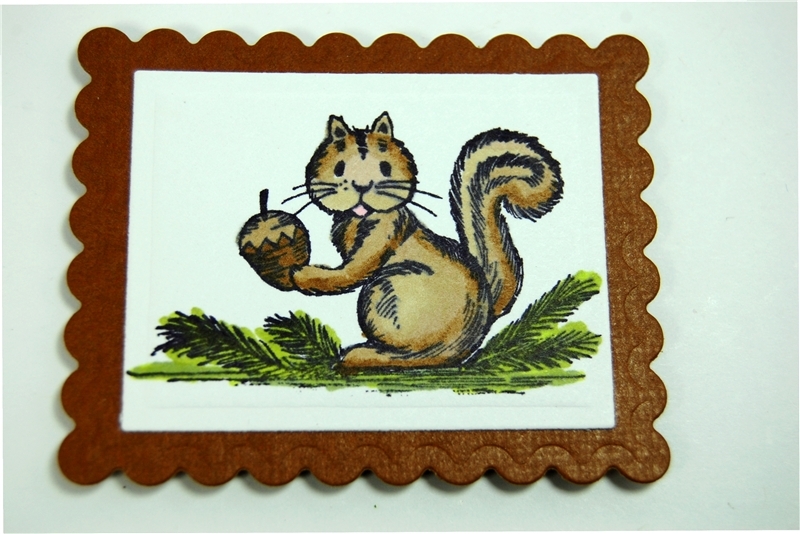 For this card I used a squirrel stamp from Great Impressions (I have had this a while and I have no idea if it would still be available). I wanted to show you the back of my image. Alcohol ink markers will bleed through the paper - don't be alarmed, this is normal. You will want to work on a protected surface and to color your image and then cut it out to layer onto your card. 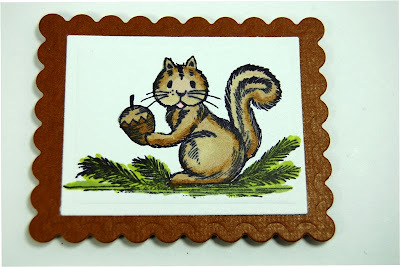 I colored with three shades of brown for the squirrel and two shades of green in the grass. I gave his tongue a little dot of pink with the bullet nib. 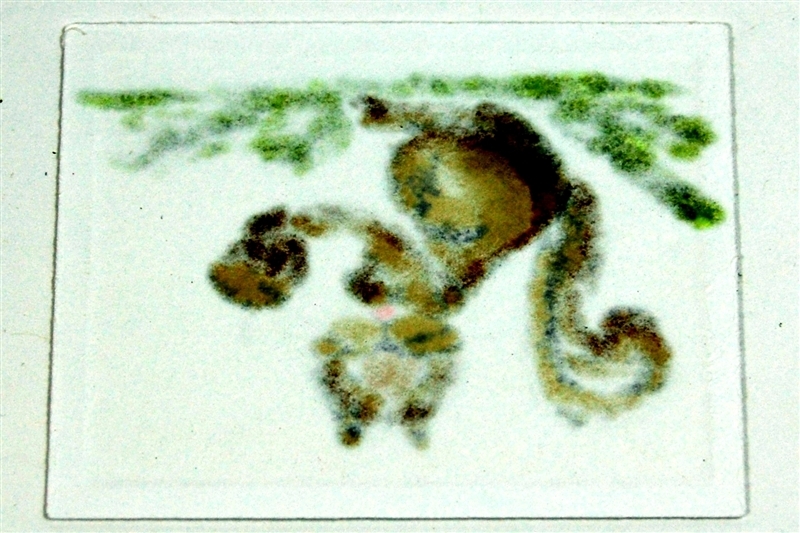 I cut the image with a rectangle nestability die and layered it on a scalloped rectangle, also cut with a nestability. 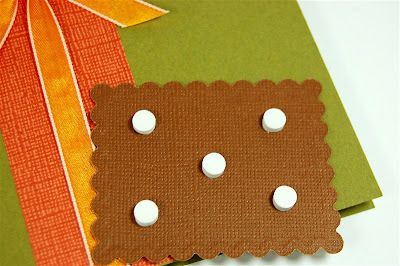 The scalloped rectangle is cut from Core'dinations textured cardstock. I use foam circles to raise if from the card surface. 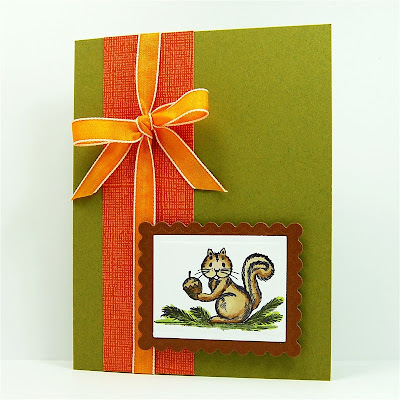 The card base is made with Ripe Avocado cardstock from Papertrey Ink. I added a 1 1/2 inch strip of orange textured Core'dinations cardstock and tied a piece of orange ribbon with white borders around the paper strip. The ribbon is from a Martha Stewart Halloween set that I found last year after the holiday. All that was left was to add the sentiment "Just for you" - I thought this was perfect for the image! I'll be trying more coloring as I settle back in at home and get some real crafting time over the next few weeks. I am very new to this and I will share what I learn along the way - the great thing is that it seems to be quite easy. I actually thought my first attempt was good enough to use on a card - and I can only improve! Here are some links to places where you can purchase ProMarkers in the US. The list price for single markers is $2.75 but I have seen prices as low as $1.49 per marker - a fairly painless way to build up a set! Be sure to follow Enfys on her blog this week as she shows you the steps she uses to color her images so beautifully. I will continue as a beginner and practice to try to master this new challenge! you did great! love the effect of the shading. TFS! I too have been watching everyone color with the Copics and had no interest in another expensive part of this hobby (own a Cricut and maybe 20 cartridges). I love Enfys blog and am very excited to learn more about these ProMarkers. Good to see that they have contacted you as well. In my opinion they have two very talented ladies "working" for them. Love your squirrel. Your coloring looks so professional. TFS. Copics were so expensive and didn't want to start another expensive hobby there. Our carts cost enough already. Off to check out these markers. It looks great! I use Copic markers and like them alot; however, I don't have a full set of them since they are expensive. I just bought pens in the colors I thought I'd use the most. I look forward to seeing some more of your creations. I started out with the Copics which are great pens; however, the price was getting very prohibitive. I saw Enfys' blog on the Promarkers and recently ordered some to try. They are excellent pens - my only problem with them is getting the caps on and off - for some reason I struggle with the caps (maybe it's my arthritis?) - but, in any event I like these pens AND the gamasol technique so I have a couple of tools in my aresenal! Thanks for the review and an excellent example!! You did a great job and the card looks brilliant. I love my Promarkers and did consider having a go at Copics but the price in the UK is not great and now having seen the comparison you did I am glad I didn't bother lol. TFS Diane. Coloring stamps has always intrigued but scared me. I have tried Copic at a class, but also didn't want the expense. Looking forward to hearing how you fair with these new markers. Thanks for educating us! Thanks for the information and for sharing your first experience. I am just starting to look into stamps and have been unsure about the whole colouring process. I'll definitely check out Enfys site! Super cute squirrel - that's what my puppy Ginny was for Halloween. heehee! And thanks for the info on Enfy's blog. I went over there and she has some great videos too! Would be cool to win some markers! Thanks! Love to learn about new products! Thanks for the info. Great info. Like you I just couldn't justify copic sketch markers. You just can't own a few and get results with them, but buying sets is just so expensive. I like stamping but do not do enough of it to justify the cost of copics. Will definitely look into these.